I would have a hard time choosing my favorite of all spring blooming flowers. Daffodils, irises, lilies, peonies, poppies, roses, tulips! Too many gorgeous ones to choose from. Well, fortunately I don't have to choose, but if I had to, it would probably come down to the iris. 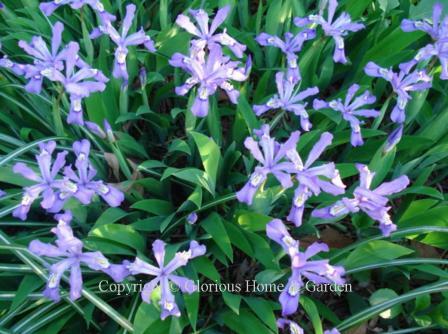 The variety of colors, shapes and bloom times is unequaled among perennials. 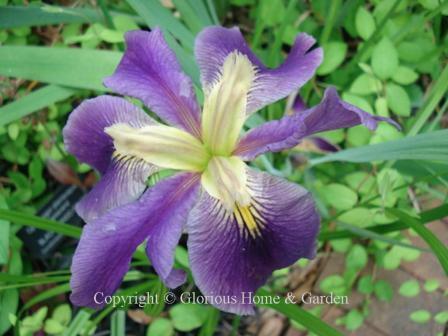 It is possible to have one kind of iris or another in bloom almost year 'round. 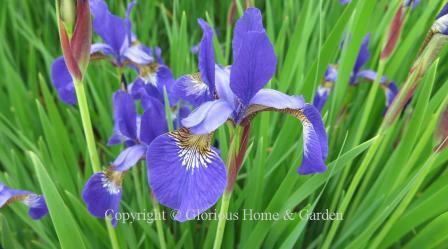 There are many different types and species of irises, and they are found all over the world. So many, in fact, that it is hard to keep them straight. But botanists and gardeners agree that the simplest way to categorize them is by type of underground structure from which they grow. They grow either from rhizomatous tubers or roots, or true bulbs. 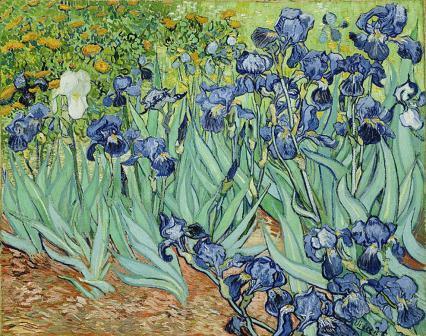 The irises below are of the rhizomatous or tuberous sorts, and are further broken down into “bearded” or “beardless’ irises. 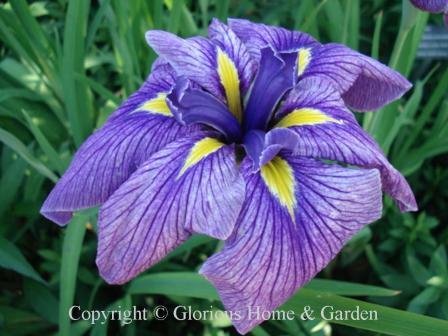 Please see the "Spring Bulbs" page for irises that grow from true bulbs. Bearded irises are distinguished by having a brush of soft hairs at the back of the falls that direct insects to find the pollen within. 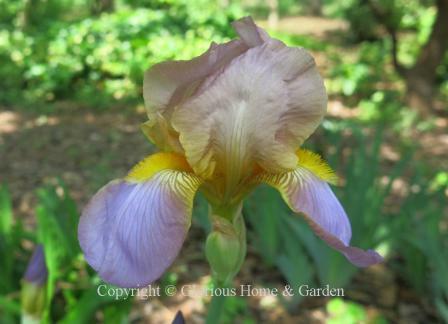 There are several types of bearded irises including our familiar garden bearded (German) irises, the exotic arils, and certain species such as I. pallida, the orris iris, grown for its root used as a fixative in perfumery. 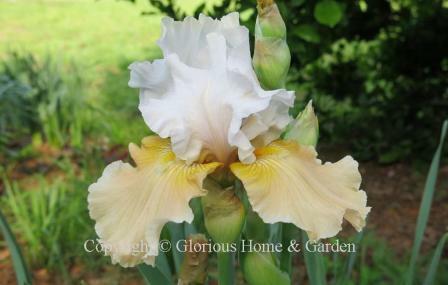 A large group of bearded irises, the arils, are not as widely grown as the I germanica hybrids. These are desert species thriving in hot, dry climates. They demand full sun and excellent drainage to prevent rot. The arils have a touch of the exotic, and have some very unusual flower forms and colors distinguished by dark beards and dark signals on the falls. Sometimes the standards are large and wide, even larger than the falls, and the falls are typically curled under. There are many species in the aril group and they are further grouped into Oncocyclus and Regelia species. 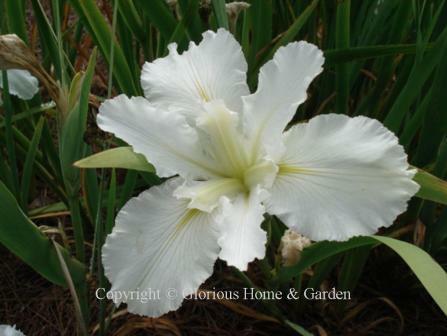 Arilbred irises are hybrid crosses between aril irises and bearded (German) irises. 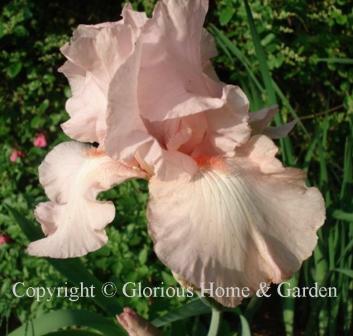 They constitute a very exciting and beautiful selection of irises for your garden if you can provide the right conditions. 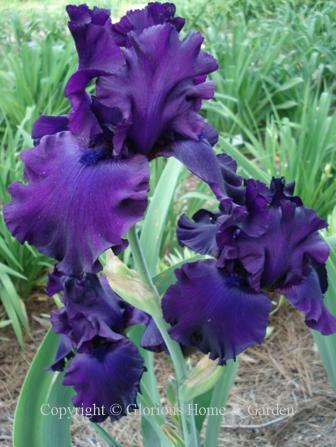 This is a very interesting and rewarding group of irises to grow, but complicated, so for further information, contact these fine organizations devoted to their culture and development. The Aril Society International, www.arilsociety.org; and the Species Iris Group of North America, www.signa.org. 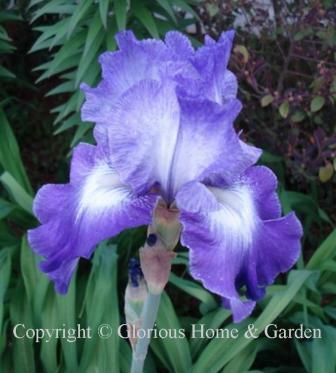 Iris germanica, bearded iris hybrids, 3-10. 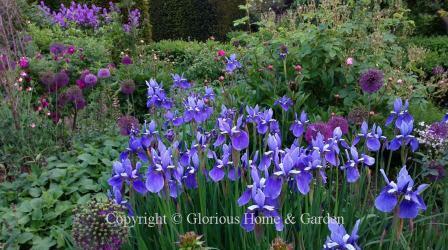 Everyone's idea of what an iris should be, bearded or German irises are indispensable in the spring garden. 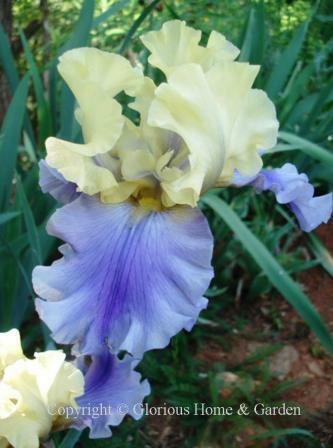 Named for the Greek goddess of the rainbow, bearded irises come in nearly every color, from pure white to nearly black. Pure red is the one color that eludes iris hybridizers. Growers dig the rhizomes in the summer for late summer and fall planting. They are best grown in full sun, and benefit from division every few years when the bloom starts to decline. 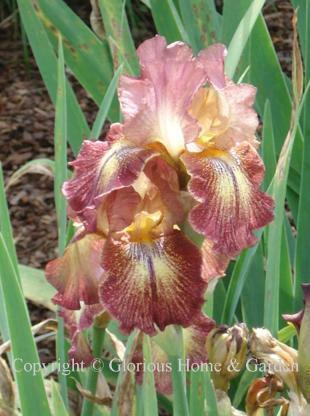 Bearded irises are further divided into six classifications based on size and bloom time: Miniature Standard Dwarf Bearded (up to 8” h.), Standard Dwarf Bearded (about 8-16” h.), Intermediate Bearded (about 16-27 ½” h.), Border Bearded (16-27 ½” h. but bloom later than the Intermediates), Miniature Tall Bearded (16-27 ½” h. w/smaller flowers), and Tall Bearded (over 27 ½” h.) With so many choices, one can have the right iris for almost any situation. Iris albicans, cemetery iris, Zones 4-9. Pure white with yellow beards, I albicans is a natural hybrid of I germanica. It was commonly used on gravesites in the Middle East, hence the common name, and the tradition was continued when it was brought to the U.S. in the 19th c. It is early blooming and very robust. Iris pallida var. 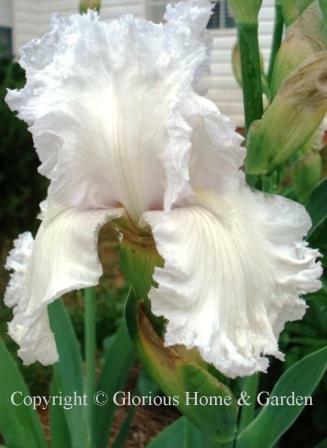 dalmatica, Dalmatian or sweet iris, Zones 4-9. 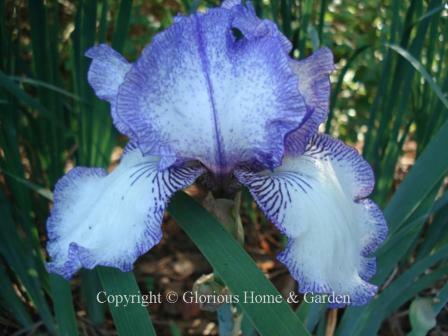 This iris is also grown and harvested for tts roots to use as a fixative for perfumes and potpourris. A native of Italy, I pallida has flowers of a rich lavender-blue with a fragrance redolent of grapes. Grow I. pallida var. dalmatica. In your garden for color, scent and a sense of history. Beardless irises include the crested irises (I. cristata); Japanese irises (I. ensata); Louisiana irises; I pseudacorus; Siberian irises (I. sibirica), Japanese roof iris (I. tectorum); and native American species including I. versicolor and I virginica, and their hybrids, among others. Iris cristata, crested iris, Zones 3-8. 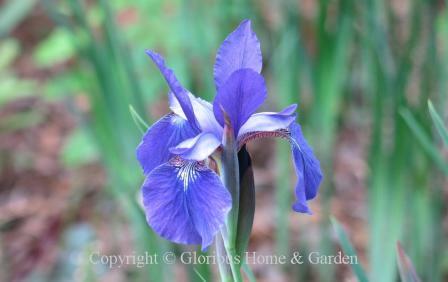 The bloom period is short, but crested iris makes a lovely ground cover especially in a shady border or woodland setting. Set out a small pot of the rhizomes and you will have a substantial clump in a couple of years. After flowering, the short, narrow, pointed leaves are attractive and neat until disappearing for the winter. This North American native has joined the mainstream of choice garden plants. 'Eco Bluebird' is shown. Iris ensata, Japanese water iris, Zones 4-9. 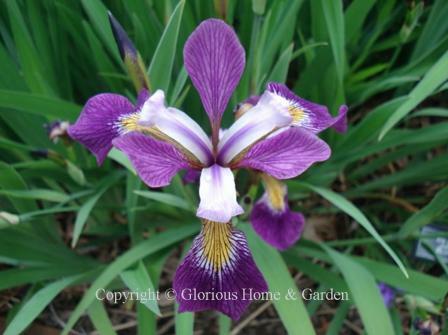 Japanese irises are absolute divas among spring perennials! Large, glamorous blooms dance above the foliage like exotic butterflies. To see them in full bloom is to want them, and why not? No need to deprive your garden of such beauty! 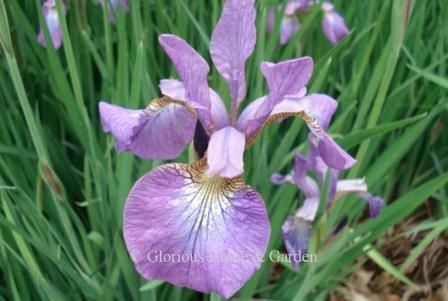 And since they bloom after the bearded irises, they will extend the iris season in the garden blooming usually in May in the South and in June and July further north. 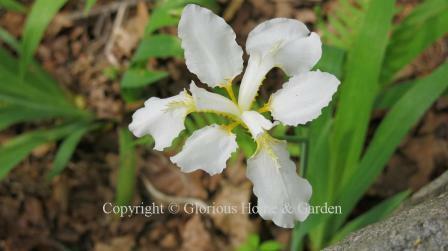 Iris ensata were developed in Japan from the species Iris laevigata and look very different. 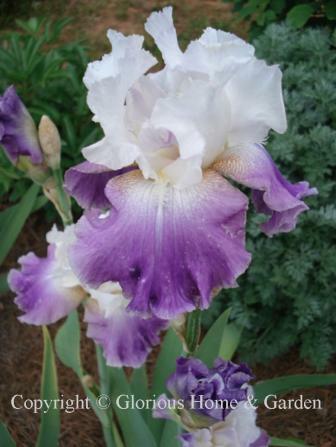 Today's most popular hybrids have large blooms that open flat with overlapping petals. There are actually several different forms recognized with the basic form being the simplest and most closely resembling the original species. Form 3F has single flowers with 3 falls. Form 6F has double flowers with all 6 petals having been developed into falls (as shown below); and Form 9-12F is very full and has more than the usual number of petals. 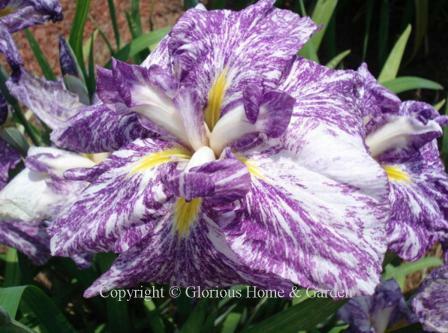 The color range is somewhat limited from white, white with yellow, pink, blue, purple, and violet usually with prominent veining or speckling and flashes of yellow in the petals. Culturally, Japanese irises require ample moisture, especially around the blooming season--but are not grown directly in water--thus they are superb grown around the edges of ponds or streams. They are heavy feeders and prefer rich, humusy soil and full sun to do their best. Iris japonica, Japanese iris, Zones 7-9. 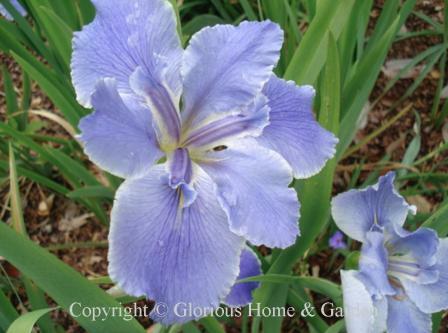 Iris japonica is a spring-blooming iris that prefers partial shade. Siting it at the edge of a woodland would be ideal, so its adventurous rhizomes can roam at will to create a lovely ground cover. Iris x louisiana, Louisiana iris hybrids, Zones 4-9. 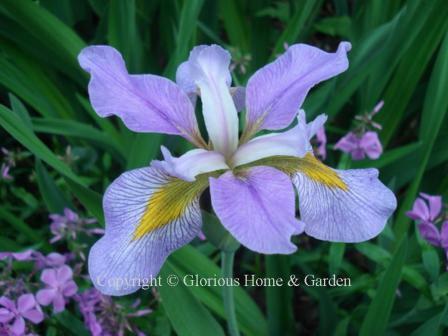 Louisiana irises were developed from North American native species, and are some of the most exciting types being hybridized today. Beautiful shades of white, yellow, coral, pink, rose, red, lavender, plum, the deepest purple and blues are available. They prefer consistently moist soil rich in humus, and partial shade. Iris pseudacorus, yellow flag iris, Zones 5-9. 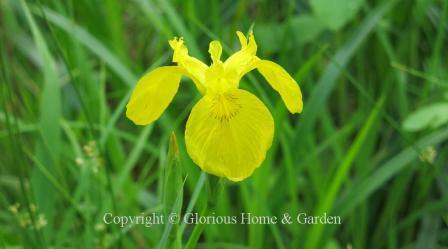 A favorite for water gardens, yellow flag iris will do well near the edge of a pond or stream. 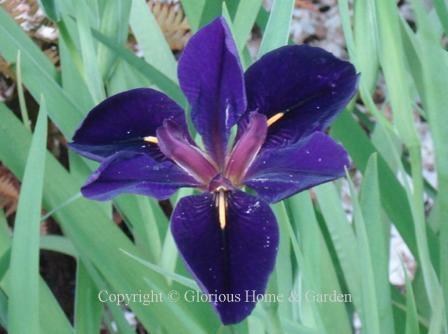 It is easy to grow, and blooms in late spring to early summer in full sun or partial shade. 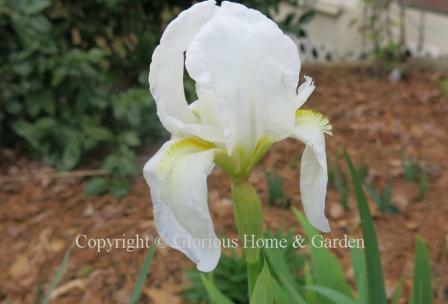 Iris x pseudata, Japanese water iris, Zones 4-9. 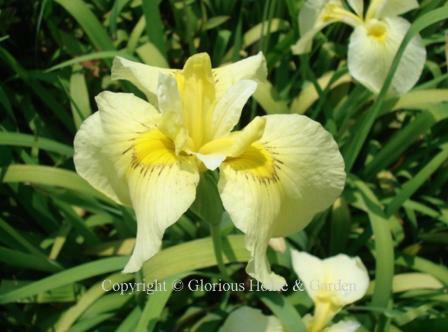 This is an interspecies cross between Iris ensata and Iris pseudacorus to introduce yellow into Japanese irises. 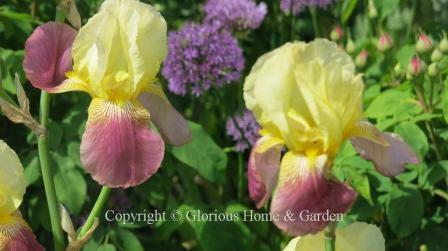 Some very interesting and beautiful cultivars have been created, most with the distinctive “eyelash” markings on the falls. 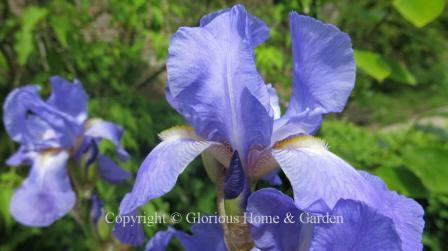 Iris sibirica, Siberian iris, Zones 3-9. 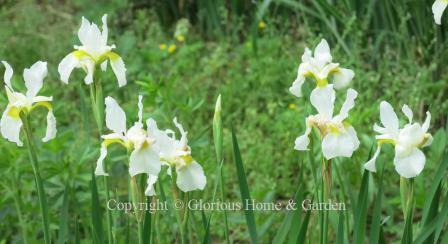 Every garden should have some Siberian irises. They are elegant perennials to use as an artist would a paintbrush to add broad swathes of color throughout beds and borders in the spring. One small division will develop into a good-sized clump in a couple of years. If you have the opportunity to visit Sissinghurst, the fabulous garden designed and planted by Vita Sackville-West, and her husband, Harold Nicholson in Kent, England (and if you love gardens, this should be at the top of your bucket list), one of the best times to visit is late May to early June when the irises are blooming. Siberians are used extensively in large groupings. Siberians come in nearly the same rainbow of colors as their larger cousins, the tall bearded irises which bloom at the same time. They are available in beautiful blues from midnight to pale azure, violets, lavenders, whites, creams, yellows, roses, and even some bronzy-gold tones. Even out of bloom, the narrow, grassy foliage is neat and tidy in the garden. 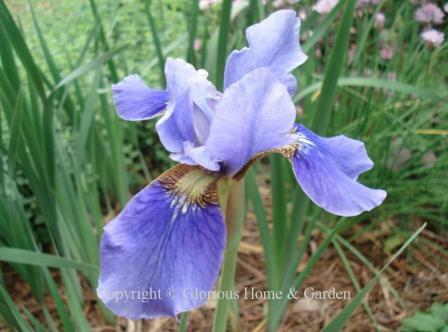 Siberian irises prefer moist soils and plenty of sunshine. I have found that they resent being disturbed. I had a large clump of ‘Caesar’s Brother’ that I dug up, separated and moved into another part of the garden, and it took a couple of years before they really put on a good show again. Iris tectorum, Japanese roof iris, Zones 4-8. 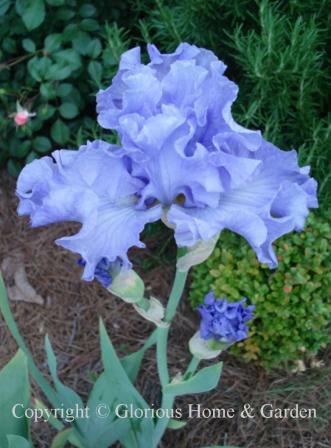 I remember buying my first Japanese roof iris at a plant sale at the Wing Haven garden in Charlotte, NC, and have been delighted with it ever since The lilac-blue flowers are large with ruffled standards and falls that open flat. The falls are decorated with darker violet spots and veins. 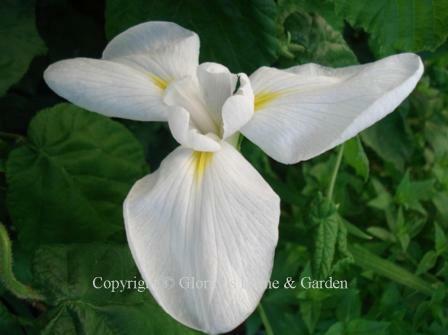 The is also a white form, ‘Alba.’ The fan-shaped leaves are neat and attractive in the garden out of flower, but will soon form a good-sized clump and will benefit from division every few years to keep them blooming. 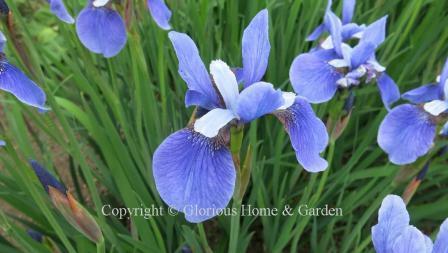 This iris is native to Japan and China where it was traditionally used as part of the thatching for roofs, hence the common name. 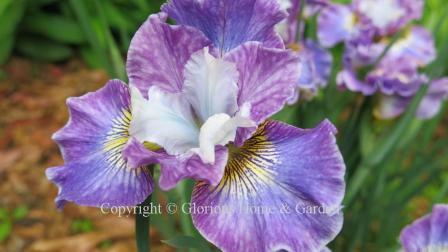 Iris versicolor, Northern blue flag, Zones 3-9. These lovely irises are native to the northeastern United State and Canada, and are found growing on the edges of streams, ponds, and other wetland situations. 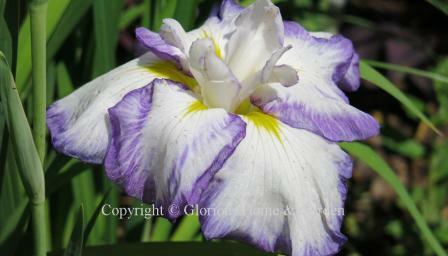 The color ranges from lavender to dark blue-purple with yellow and white splotches with veining on the falls. ‘John Wood’ is a lovely selection with larger flowers and a color that is more red-violet than the species. The foliage is beautiful too, being dark purple at the base as it emerges in the spring. 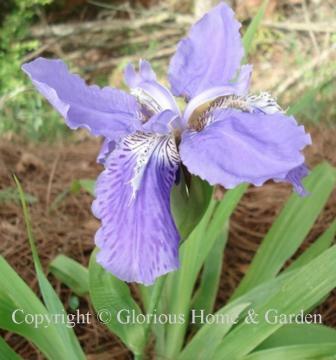 Iris virginica, Southern blue flag, Zones 5-9. The Southern equivalent of I. versicolor is a native to the southeastern United States, and is most commonly found in wetlands and coastal areas. In spite of its preference for sandy, boggy soils, it will do well in gardens as long as the soil is moisture-retentive, and it prefers full sun. This would be a good choice for the edge of a pond, native habitat area, or wetland restoration. The species is a pale blue to blue violet with veining and a yellow area on the falls, and grows about 2’ tall. ‘Southern Wanderer’ is a selection that has lighter lavender standards and light blue-violet falls with veining and a yellow blotch. The standards and falls are distinctly separate, and make an almost flat flower.